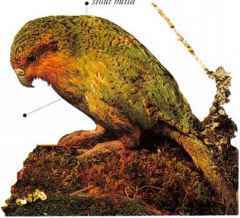 Large and heavily built with bright orange tinderwings and a long point on its bill, the Kca is a mountain parrot. It lives in alpine scrub, in grassland, and at the forest edge in areas with winter snows. 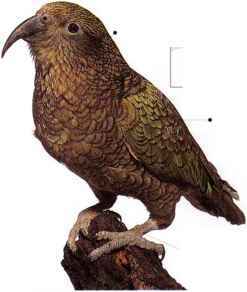 The Kea spends most of its time foraging on the ground. It is bold and inquisitive in its behavior, prepared to look for new food sources and to explore around houses and farms. With its long bill, it probes the ground for insects and grubs and tears into carrion. Other foods are buds, leaves, fruits, seeds, nectar, and blossoms. Keas fly powerfully and wheel and circle in the strong mountain winds, calling with the raucous "kee-ah" that provides the name. 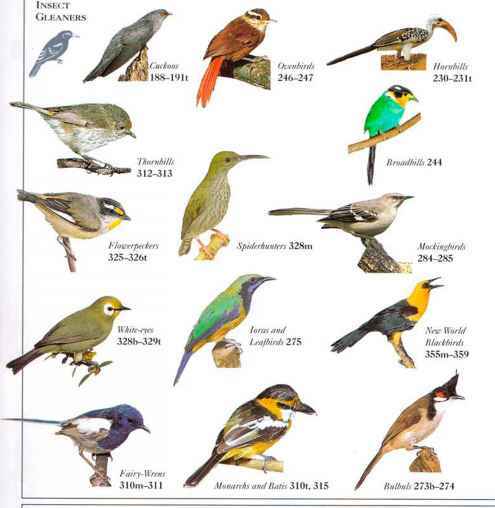 Young birds form flocks, but adult males live in territories and are polygamous, with up to four mates. • NliST A rock crevice or cavity under a rock, among tree roots, or in a log. lined with moss, lichen, leaves, twigs, and chewed wood. • DISTRIBUTION Mountains on •South Island of New Zealand.